After several months of busy planning, look-your-best dieting, and an amazing wedding day surrounded by family and friends, all we wanted from a honeymoon was a peaceful, tropical escape and a lot of great food. We planned the basic skeleton of our trip and mapped it out on Traveler’s Joy before our wedding, but gave ourselves a month between the big day and the trip to collect ourselves and finish the travel plans. We’re so glad we did. Especially because it gave us something else to look forward to after the wedding! We chose Mexico for its promise of sandy beaches, hammocks and no jet leg. – a “lazy” trip, so to speak. And while getting to Mexico was relatively easy, and there were indeed hammocks, we were pleasantly surprised by the wealth of culture and history we encountered on our trip. Of course this had a lot to do with our choice to forgo the typical gringo accommodations of all-inclusive resorts and spring break beach scenes. It was Mexico, our way. To ease in to our nine-day trip, we started off in touristy Puerto Vallarta in Jalisco on the Pacific Coast. 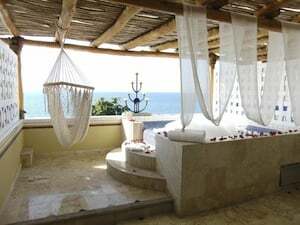 The Villa Premiere Hotel & Spa was the obvious choice when we saw a photo of their honeymoon suites online – a private, ocean view patio with a Jacuzzi scattered with rose petals and, ta da, a hammock. Perfect. Lucky for us, Villa Premiere was situated a short walk north of downtown Puerto Vallarta, much closer to the action than the enclave of all-inclusive resorts further up the coast, but still peacefully apart from the busy public beaches. In addition to spending a lot of time soaking in our Jacuzzi, we thoroughly explored Vallarta’s downtown – its beach bars and crafts markets, its restaurants and churches – and tried out many, many taco carts and huarache vendors. Risky behavior, perhaps, but our digestive tracks made it through unscathed. We got roped into two time-share pitches before we finally learned to wave off the aggressive hucksters which the city is lousy with. While in Puerto Vallarta, we decided to fully embrace our tourist status and sign up for a swimming-with-dolphins excursion at the Vallarta Adventures marina. We also happened to be in Mexico for November 20th, which is Revolution Day, and we were treated to a lively performance of traditional dance in the public square. Meanwhile, November 22nd is Dia de Santa Cecilia, the patron saint of mariachis, and we were serenaded by not one, but two mariachi outfits while we waited on the Playa de los Muertos beach for the water taxi that afternoon. It can be hard to relax on the beach in Vallarta with the constant interruptions from souvenir vendors, so it was a welcome escape to ride 45 minutes across Banderras Bay to the little fishing village of Yelapa. The two of us rarely sit still, so visiting a sleepy beach community was a challenge for our personalities. But after about a day in this rustic paradise, we felt completely at home. So small is the community in Yelapa – only a few hundred people – we were recognized on the road by a fisherman who offered to take us out on his boat to go snorkeling. “I saw you at the restaurant this morning. You’re staying in room 19 – that’s the best room.” He was referring to the honeymoon casita at Hotel Lagunita, one of just a few, quaint guesthouses in town. And we agreed, it really was the best room. Our thatch-roofed cabin featured an open air shower with a view of the ocean and a porch right above the hotel’s picturesque pool. At night we slept curled up with a curtain of mosquito netting around our bed like our own little fort. The first morning in Yelapa, we set out to find a breakfast spot we’d read about in the village. But when we reached the other side of the beach, we discovered that it was high tide and the river was separating us from town. Unsure of what to do, we walked up and down trying to find the best place to ford the river without getting our clothes wet, but thankfully an old man with a double-hulled canoe came to our rescue and took us across for five pesos each. That particular week, a yoga club was also staying at Hotel Lagunita and we did our best to not roll our eyes too much at their “Namaste” greetings and meditation gatherings on the beach. We spent most of our time dipping into the pool or hiking around the hilly, carless town. One morning we hired a guide to take us on horseback up the river to a secluded waterfall. We cooled off in the sandy pool below the falls. Later, Zeph hiked into town and bought a smoky local moon shine called Raicilla while I vegged out in a lounge chair with a book and a cocktail in a coconut. Yelapa was definitely the kind of place we could stay awhile. But after three relaxing days, and lots more shrimp and tacos (most notably at the restaurant Tacos y Mas in the village), we motored back to Puerto Vallarta to fly to our next destination: Oaxaca. The city of Oaxaca, in the state by the same name, is situated in the highlands of Mexico’s southern Pacific coast. Hours from the beach, Oaxaca is the cultural flipside of the palm tree and margarita scene of Puerto Vallarta. Spanish colonial architecture defines the landscape of the capital city with its cobblestone streets and abundant cathedrals. We wanted to visit Oaxaca because of its reputation as Mexico’s culinary epicenter. It’s known for two main ingredients – chilies and chocolate. While Zeph was more excited to dine on the former, I wasted no time getting my hands on the latter. After checking in at the Casa de Sierra Azul hotel, we walked straight to the zocolo, or city center, and sat down at one of the very European sidewalk cafes for hot chocolate con agua and shots of Oaxaca’s state booze – mezcal, which is served with a side of lime and worm powder. While in Oaxaca, we took a cooking class at the Casa de los Sabores guesthouse. Since we were the only two people to sign up that day, we got a private lesson from the instructor. She took us to the local mercado for fresh chicken, queso, chilies, cactus and vegetables before teaching us how to make traditional Oaxacan dishes in traditional Oaxacan ceramic ware. We were so dazzled by the market that we spent the next two days wandering the chaotic aisles of the different city markets shopping for cookware and sampling chocolate, bread, cheese and mole dishes – the signature sauce of Oaxaca. We didn’t, however, have the nerve to try the city’s popular local snack, available at many street vendors: Chapulines, or spicy toasted grasshoppers. 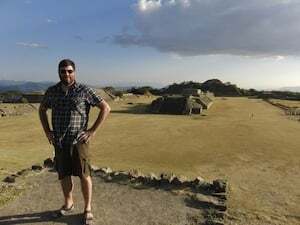 Our last day in Mexico we took a bus out to the ancient Zapotec archeological site of Monte Alban. These ruins date back as far as 500 BC and you can still see detailed petroglyphs carved into the rocks. It was a truly breathtaking place, like a temple in the sky. 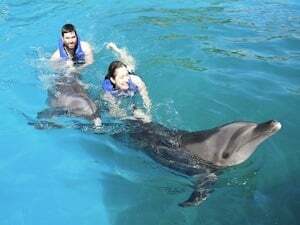 It was great after such a memorable week to be able to write our friends and family who contributed to the trip through Traveler’s Joy and tell them “Thank you for the cooking class – here’s what we made…” or “Swimming with dolphins was amazing! Check out this photo...” And even though not every element of our $5,000 trip was covered through Traveler’s Joy gifts, it was convenient to redeem the lump total of our honeymoon fund from the site and combine it with other wedding monetary gifts to cover all the costs!